Sunday 24 June, a blisteringly hot day for eight walkers making their way from Bowes to God’s Bridge and back to Bowes. Straight away I must explain that God’s Bridge is a natural limestone bridge over the River Greta south of the A66 in an area near Mellwater, 3 kilometres west from Bowes. The site is an SSSI where the Pennine Way crosses the river. Ed had chosen a super clear day to amble along the river from Bowes taking in the remains of Bowes Castle built in 1187 for Henry II. The site was also a Roman fort serving the road across Stainmore. We thus had plenty of geology and history to keep our minds alert whilst we ambled along. The noise from the A66 was a little intrusive at times but we were quickly able to ignore it in favour of the bird song and the most enjoyable chatter between the walkers. After pausing a while at God’s Bridge to study its geology and flora we made our way up to the A66 crossing by way of a subway to continue along the Pennine Way on the northern side. Was it a golden plover we heard ‘peeping’ across the moor? The consensus of opinion was that it was as we were able to glimpse it amongst the tufty grass, and then we checked with Mr Google who knows about these things. Lunch was a miraculous stop at what could have been a five star restaurant. 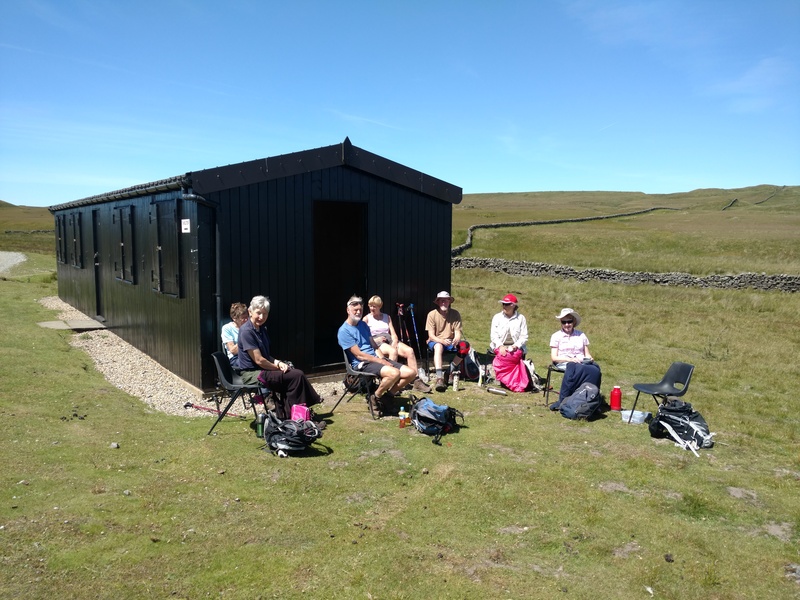 It was actually a shooters’ lodge or hut, but there was Ed bringing out chairs and shooing away the sheep and flies so that all we needed were Italian waiters and glasses of Pimms! Such luxury! Our walk continued eventually in an easterly direction to West Stoney Keld with our attention being diverted by an air ambulance at work somewhere behind us. We hoped it was just an exercise. Slowly the noise of the A66 returned and we headed south down the road to Bowes. We passed the house chosen by Charles Dickens as his Dotheboys Hall in Nicholas Nickleby, now a private dwelling at the west end of the village. We also passed by the rather lovely Ancient Unicorn Inn. I know we certainly would not have passed it by if Graham had been with us but he was watching a football match so he missed an extremely fine walk and probably a good pint too. Thankyou Ed for your company and for leading such an interesting and enjoyable walk.